What is a Draft Board Stand? This is used to hold your paper Draft Board rather than hanging it on a wall. This heavy duty cardboard stand is designed to hold your draft board when there is no wall available. The stand is constructed of heavy corrugated cardboard and has a unique design that makes it sturdy from top to bottom, and IT WON'T FALL OVER!. Our stand has 16" deep leg supports compared to only 6" for the other guys board. This give our stand extra stability! The stand measures 48 X 70 inches which will hold any of our regular size draft boards. The Jumbo board comes in 2 panels will require 2 stands. If you order the Jumbo Stand, 2 stands are included with that item. The stand is designed to easily sit on a standard 6 foot table. The stand has a matte white finish so it looks neat and clean and since it is not glossy, you can write on it with no problem if you desire. 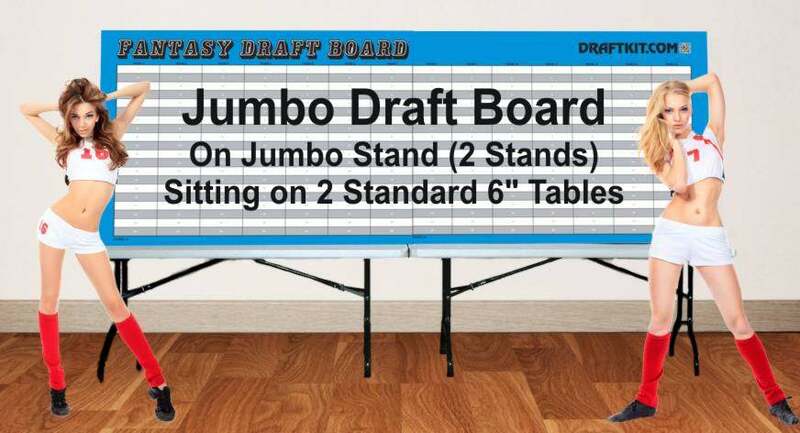 Best of all, since the draft board is not printed on the stand, it is reusable time after time. You can use it for multiple leagues, save it from year to year, and use it for business or school presentations. The stand comes shipped in a large 18 X 48 X 2 inch package and your Draft Kit will also be packed inside. Due to the size of this package, Stands can only ship via FedEx Ground, and in some cases Priority Mail, but can't be shipped to Express, or to Canada, AK, HI, or APO addresses.